WHEN IT COMES TO KEEPING TRACK of the family’s health, there are plenty of variables. Between your children’s pediatrician appointments and flu shots to checkups for mom and dad, there’s always the chance that something will get overlooked. However, dental health is just as important to keep up with, no matter if you’re 5 or 45, and many people still have questions about when to see a dentist or orthodontist, or what the difference is between traditional braces and Invisalign. Suburban Family wanted to clear a few things up, and the local dental community was happy to help. 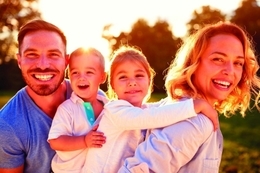 Read on to hear what they recommend for keeping your family’s smiles as bright as can be. How do you help a patient conquer fear? Should a child see an orthodontist only if he or she may need braces? Why is it important to maintain a good relationship with your child's orthodontist?